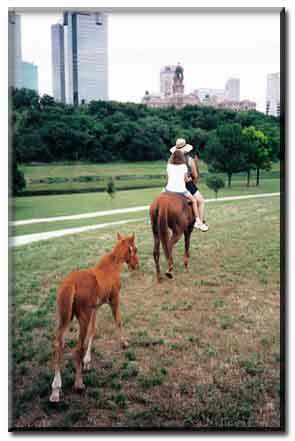 Enchanted Rose, followed by her filly Miss Easter on a trail ride on the Trinity River at the base of downtown Ft Worth. This was a wonderful trail ride for some 10 of us. Pictured on Enchanted Rose is myself and my granddaughter Raven! What a fun day that was. Come and join us ! Raven on Legacy's Beauty. 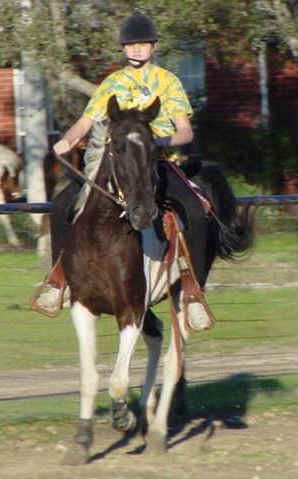 This picture was taken in the spring of 2005 when Legacy's Beauty was two years old. She is such a calm sweet mare. She is due Spring of 2006 bred to Majestic Miracle. More pictures and stories to come!!! !